Robert Accordino is the US Founder of Music for Autism. He is a physician who has carried out research on and worked clinically with individuals with autism and their families, as well as advocated for this population. Music has played an integral role throughout Robert’s life, as he performed in his early years as a baritone. Thus, it was quite natural for him to parlay his interest in music as an undergraduate at Princeton University and as a graduate student at Oxford University, where he researched the musical processing in individuals with autism. Music for Autism blends his unique combination of experiences working with autistic individuals and making music. Gardner: Robert, can you tell me a bit about Music for Autism? Accordino: Music for Autism is committed to improving the quality of life of and raising public awareness for individuals with autism and their families through music. The concerts, held in the United States and the United Kingdom, feature professional musicians, including Tony Award winners, Grammy-nominated classical artists, and Pulitzer Prize winning musicians. Gardner: What is the mission of Music for Autism concerts and the intended impact on their attendees? Accordino:The goal of Music for Autism is to expose those with autism and their families to high quality, professionally performed music in an environment where individual differences are celebrated and where no one will be embarrassed. Families are greatly challenged to ﬁnd programming that is appropriate for their family members with autism who may exhibit behaviors that are unpredictable. 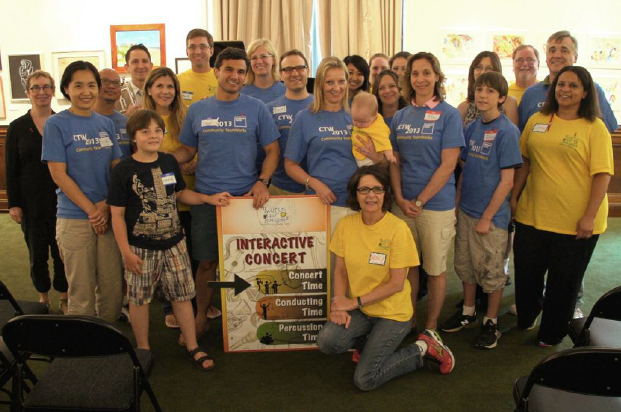 Families say that Music for Autism’s unique and interactive “autism specific” musical programming greatly enhances their quality of life. 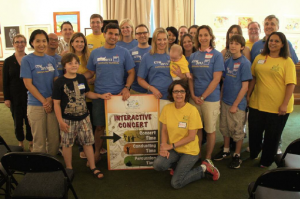 In addition, since all US concerts are fully subsidized, anyone with autism may attend with family members, irrespective of socioeconomic status, and may experience Music for Autism’s unique, interactive programming. Gardner: What is happening currently? Who is performing? What trumpeters have participated? Accordino: We are actively engaged in our concerts for this year and planning concerts well into 2014. At the beginning of this year, in New York City, we began bilingual concerts in English and Spanish. Some of the artists who have recently performed with us and who will soon perform with us this year include: Enso String Quartet, Quattro, soprano Julia Chalﬁn, the Doo-Wop Project featuring performers in Broadway’s Jersey Boys and Motown, Aurista Chamber Music, Presto! Music and Magic featuring musicians from the National Symphony, The Rice Brass, Lyris Quartet, singers and guitarists Andrew Ross and Chloe Lowery, La Familia Sextet featuring Willie Martinez, Ardelia Trio, John Arthur Greene who currently is in Matilda on Broadway and you performed with us in New York City at the 92nd Street Y this past July. We have had Mike Zonshine, principal trumpet of the Hawaii Symphony and Los Angeles freelance musician as well as Kiku Collins, a dynamic jazz trumpet artist, as performers. Additionally, Marie Speziale, retired trumpet professor at Rice University has been instrumental in helping us ﬁnd exceptional talent to participate in our Houston concerts. We are always looking to add new, interested musicians to our concerts! Gardner: As I can attest, it is a very rewarding experience! Robert, why do you think Music for Autism is so special? Accordino: We allow amazingly talented performers with a commitment to service to share their music with those who might not otherwise be allowed to have that experience. Music for Autism is a group of amazing people, all of whom are passionate about helping and giving selﬂessly to others to bring joy and acceptance to the families we serve. Gardner: How can my fellow trumpet community get involved? Accordino: Perform for us! Introduce us to other amazing musicians who can perform. Spread the word about our concerts to those who you know would enjoy them. Help us by soliciting donations so we can continue this important work. All of our concerts are free, to allow everyone the opportunity to attend, so funding is vital. For more information on us, please check out our website (http://www.musicforautism.org) or send us a note by email (info@musicforautism.org). Most importantly, and we hope this is easy for your readers to understand and appreciate, remember that everyone should be given the opportunity to experience the joy of music! About the author: Ryan Gardner is Assistant Professor of Trumpet at Oklahoma State University. Originally from Santa Monica, California, Gardner received his BM from the Eastman School of Music with highest distinction, his MM from Rice University – Shepherd School of Music and his DMA from the Manhattan School of Music. As a Bach performing artist, Gardner actively performs as an orchestral, chamber, and solo musician; and he also provides masterclasses and lectures internationally. He is indebted to all of his primary trumpet teachers: Vincent Penzarella, Mark Gould, Marie Speziale, James Thompson, Boyde Hood, and Paul Salvo.